The gray wolf is a canine native to the wilderness and remote areas of Eurasia and North America. It is the largest extant member of its family, with males averaging 43–45 kg and females 36–38.5 kg. Coat colour is, in southern Europe, most of all cream, ochre, brown, grey and black. Differences in coat colour between sexes are largely absent, though females may have redder tones. It adapts almost to every type of habitat, but locally it is found in the wildest and most undisturbed oak forests and badlands. Their original worldwide range has been reduced by about one-third, by poisoning and deliberate persecution due to depredation on livestock. Since about 1970, legal protection, land-use changes and rural human population shifts to cities have arrested wolf population declines and fostered natural recolonization. 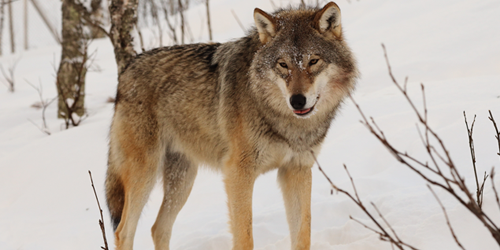 Continued threats include competition with humans for livestock, exaggerated concern by the public concerning the threat and danger of wolves, and fragmentation of habitat (IUCN, 2010). Locally, the deterioration of forests, the competition with humans for livestock and game, the human disturbance during leisure activities and the presence of roads are the main threats to this species. Till 20 years ago the species was not present in the site IT4070011 Vena del Gesso Romagnola. The rapid expansion to which the species is subject in Italy has led to the presence, in recent years, of at least two reproductive families and other small groups of young specimens, in the areas of Monte Penzola, Riva di San Biagio e Monte Mauro. In this area we will maintain and improve forest structure and composition, thus increasing biodiversity and, therefore, the habitat quality and the abundance of prey.